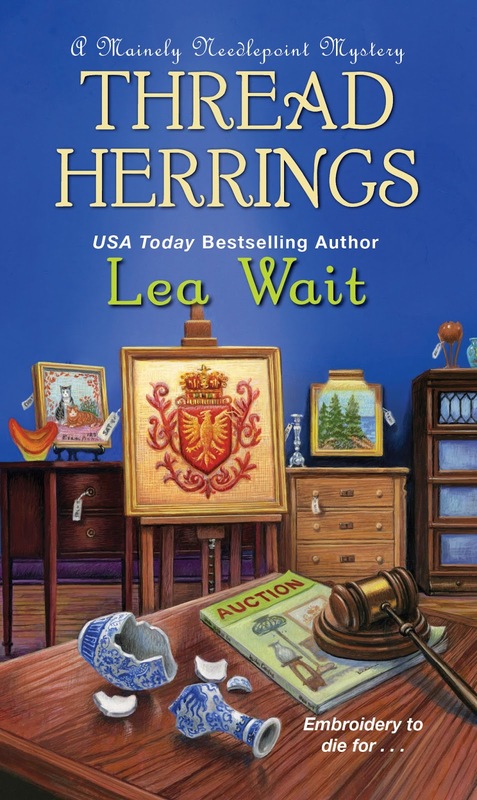 Mystery novelist Lea Wait is helping me wrap up the week by chatting with me about her new cozy novel, Thread Herrings, A Mainely Needlepointer Mystery. Lea Wait lives on the coast of Maine. A fourth generation antique dealer, and author of the Agatha-nominated Shadows Antique Print mystery series, she loves all things antiques and Maine, and she’s learning to do needlepoint. She also writes historical novels for young people set in (where else?) nineteenth-century Maine. Find her at Facebook, Goodreads, and her website. I’m a fourth-generation antique dealer, so it makes sense that Angie Curtis, my protagonist, has a close friend, Sarah, who’s both a needlepointer and an antiques dealer, and that Sarah would take Angie with her to an auction. Angie can’t resist bidding on a piece of 18th century needlepoint … and then wants to learn more about it. And so the mystery begins. I’d parked near Sarah’s shop and apartment. This time of day she’d be sorting and pricing items for her shop, or studying recent prices for antiques. I decided to stop and see her. I was two stores away from her door when my phone rang. I pulled it out quickly. Clem? But it wasn’t Clem. It was Pete. Most small towns include a few characters who, because of intellectual disabilities or mental health issues, are accepted by the town, and play a role in it, but basically live their lives in parallel with others. Ike Hamilton has lived in Haven Harbor all of his life, where now he lives on disability payments and collecting bottles for deposits. So why would anyone want to kill him? And who is the teenaged boy who Ike had been watching out for? Thread on Arrival will be published in May of 2019. Since I learned to read, I’ve wanted to be an author. In college I wrote poetry and plays, and my first post-college job was as a corporate executive speech writer. I supported myself doing corporate writing and writing about adoption (I adopted four older girls as a single parent and was an adoption advocate) while I raised my family. I’ve been a full-time writer for twenty years now, although I continued my antiques business for the first ten of those years. Thread Herrings is my twenty-fifth published book; I write three mystery series for adults and historical novels for young people. I only use one pen – a Bic GripRoller Fine. I buy them by the box, and always use them to sign my books. A writer, of course. Also a marine biologist, president of the United States, and an archaeologist. Three of those four occupations didn’t work out, but are still interests of mine. When I was single I was an adoption advocate and adopted four daughters. Now I write mysteries and historical novels about people searching for love, acceptance, and a place to call home. Thanks for being here today, Lea.